PA religious affairs official claims Israel is preventing Palestinians from sounding call for prayer at the Cave of the Patriarchs. Youssef Ideiss, the Palestinian Authority (PA) official in charge of religious affairs and endowments, is accusing Israel of preventing the sound of the muezzin from being heard near the Cave of the Patriarchs in no less than 53 instances. 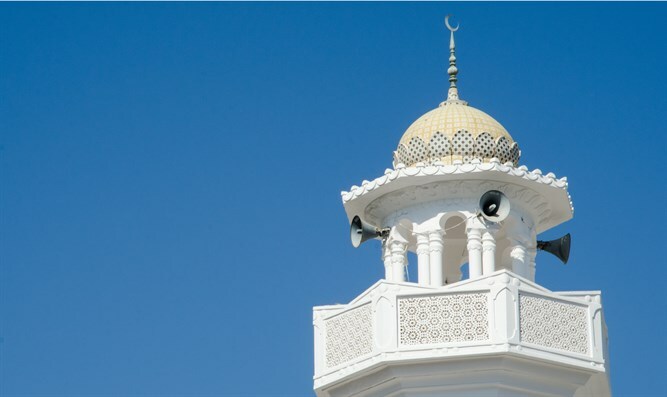 The muezzin is responsible for calling Muslims to prayer five times a day using a public address system on the minaret of the mosque. The morning prayer must take place before dawn and the muezzin's call precedes it in order to wake the inhabitants for prayer. Ideiss claimed in a statement he published on Monday that Israel prevented the call of the muezzin 645 times during 2017, thereby violating the Muslims' right to worship. He called on the UN’s cultural body, UNESCO, to work to end "attacks on the sanctity of Islam." Last July, UNESCO approved a resolution declaring the Cave of the Patriarchs to be an "endangered Palestinian heritage site." Israel announced last week that it would withdraw from UNESCO at the end of 2018, thereby joining the United States, which announced several months ago it would also leave the organization due to its anti-Israel bias.